Need a Home Appraisal in the Houston Bear Creek Village? Our Texas certified real estate appraisers perform residential and commercial appraisal services throughout the Bear Creek area for both independent use and lender applications. Our goal is to provide our customers with a expedient, well researched and comprehensive appraisal service that meets or exceeds their expectations and requirements for use. Not only do we complete our appraisal assignments faster than most other appraisal companies, we advertise some of the lowest fees for appraisal services in the market. We only staff appraisers that are local to the Houston area and are experienced with its varying markets. Our staff is capable of completing jobs for residential, commercial or mixed-use properties. For commercial projects we only assign Texas Certified General appraisers with at least 10 years of experience in the Houston market. Whether you need a real estate value report for financial, private use or a legal matters, our appraisal services will work for most real estate valuation needs. We are dedicated to providing competent, courteous and prompt services to all our customers be it homeowners or industry pros. If you’d want to go over your appraisal requirements in more detail please connect with us via the number on this site or the online contact form found above. 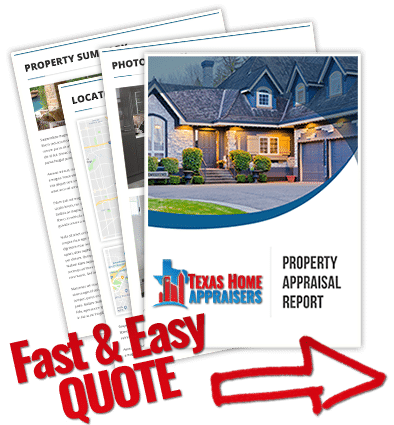 If you are looking for a public houston real estate appraisers to carry out a quick and accurate appraisal for your property, call the number above today or use the short web quote form. What is the definition of a comparable sale? A comparable sale is a property, that is similar to the subject property in most respects, is located in a similar (nearby) location, and has sold recently at arms length. The selection of comparable sales is in most residential appraisals, the single most important determining factor in establishing value. It is the appraiser’s responsibility to adequately research the local real estate market and determine which comparable sales best represent the value characteristics of the subject property. A real estate appraiser must be licensed or certified through a state agency and is required to meet educational, experience, and examination requirements. Additionally, appraisers must perform several thousand hours of appraisal work as an apprentice before gaining their license. Appraisers are also required to prove geographic competency for their market area. Frankly, it’s apples and oranges. A CMA will most be comprised of a market comparison approach. Appraisals use comparable sales with a much higher level of adjustments performed to them. Land and building prices are also important in an appraisal. A CMA delivers a “ball park figure”, an appraisal delivers a defensible and carefully documented opinion of value. The most influential of all these factors is the person creating the report. Realtors are not required to have market area competence or knowledge or home valuation to create CMAs. Unlike agents, an appraiser must possess explicit market area knowledge when performing an appraisal. The appraisal is created by a state certified professional who makes a living out of valuing properties. An appraisal contingency protects the buyer by giving them an “out” of the contract should the home not appraise (i.e. the value of the home comes in lower than the sales price). Example: if a property is under contract for $400,000 and the appraisal comes in at $390,000, then the buyer has the option (in addition to other contingencies) to exit the deal and recoup any earnest money.